Limited 15 disc (14 CD + PAL/Region 2 DVD) box set from the Metal vocalist. After leaving Black Sabbath, the legendary Ronnie James Dio formed his self-titled super group with a string of seminal releases that continue to influence the worlds of Hard Rock and Heavy Metal to this day. 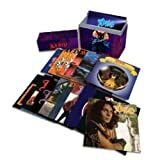 This Singles Box Set gathers all of the band's classic singles on Vertigo/Universal in replicas of the original release, as well as a DVD featuring all of the corresponding promo videos and a book featuring their complete Vertigo discography.